Antoine Yared as Romeo and Sarah Farb as Juliet take puppy love to a consequential ending in the Stratford Festival production of Romeo and Juliet on stage until October 21, 2017. A high calibre ensemble helps heighten Shakespeare’s glorious, poetic textures and rhythms. What’s up with family always putting a damper on hot romance between two people? It’s hard enough as it is to meet that special someone that makes you weak in the knees and when you do, parental units and others have to weigh in on matters to complicate things. 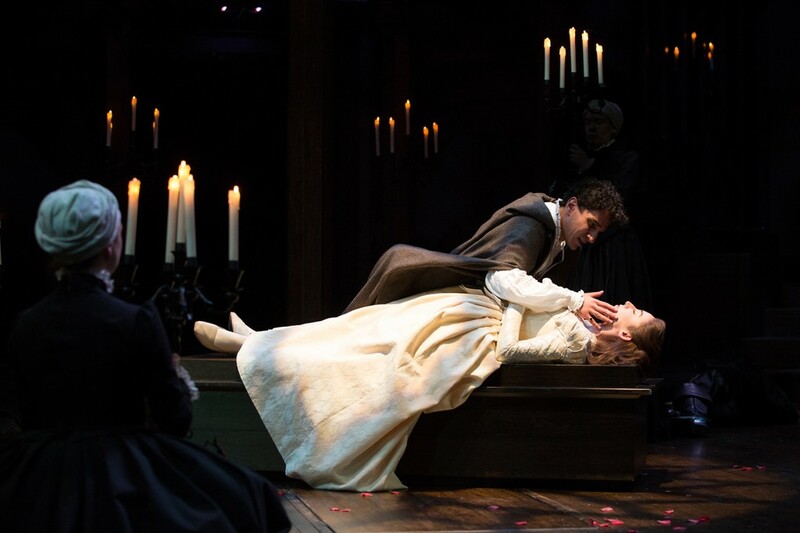 And when a theatre company decides to pump new life into a classic tragedy like Romeo and Juliet, there always seems to be a right and wrong way to impede things further. Dressing characters in space suit costumes and setting Verona on distant planet might miss the mark of perfection but providing a capable cast are able to effectively work the text for deeper meaning, a production can get away with almost anything. The Bard’s timeless tale of star-crossed lovers, family feuding and the true cost of faking one’s own death gets much needed lift from director Scott Wentworth who keeps things classical on the stage he’s performed on so many times before. This glowing production serves the central character’s arc remarkably well and Shakespeare newbies have zero chance of getting lost in the swift moving story. This is to the credit of Antoine Yared’s ‘virtuous and well governed’ Romeo and Sara Farb’s teenage Juliet. The performers skillfully avoid the whininess of young hearts not getting what they want and instead deliver a sophisticated sensibility in their emotional response to tribulation that surrounds them. What a thrill to see Sean McKenna in the role of Nurse to balance reason with Randy Hughson’s radiating intense heat in his angered moments as the head of the Capulets. Mercutio may lack dimension in other presentations but not so with Evan Buliung around for sword swinging action. When the actor relies on cynical antics to mock another, only then do you see the full potential of what Shakespeare’s works can be. If you feel compelled to bite your thumb at anyone this summer, it might be wise to take time out to see why families should try and win the peace because there’s never a happy ending trying to win the war.